One very common challenge that facility managers and warehouse owners face is the limited amount of space available for both supplies and stock. Because building expansion and additional locations are not always feasible to the bottom line, creative and innovative storage solutions become instrumental to every day operations. As Chicago’s material handling specialists, we recommend going vertical. Increased Product Inventory – Rather than having to make the painful decision as to what stock will be kept on hand, ensure that your product inventory remains at its workable best. By taking advantage of every inch of usable space, you’ll be able to keep back-orders to a minimum. Authorized Access – By only allowing certain employees access to vertical carousels and lift modules, you’ll enjoy a greater level of security. 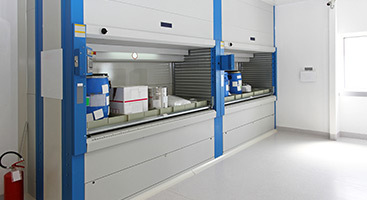 Remove sensitive records and/or valuable products from heavily-accessed areas and place them in vertical storage units that offer added security. Reduced Risk of Injuries – By using an automated storage and retrieval system, you can keep your employees safely on the ground and utilize dangerous forklifts less. Letting the shelving do the work for you, your employees experience a safer workplace. More Effective Record-Keeping – By allowing users to archive files in a more efficient manner, vertical office carousels free up valuable office space and reduce the amount of records needed at any one time. This solution helps to free your space of clutter and optimize office processes. Decreased task implementation times – Vertical storage and retrieval systems can be automated to reduce inventory redundancy and warehouse confusion. By lessening the need to wander warehouse aisles trying to locate certain products, your employees can pick correct products and fulfill orders in a timely manner; which in turn, creates a better overall customer experience.